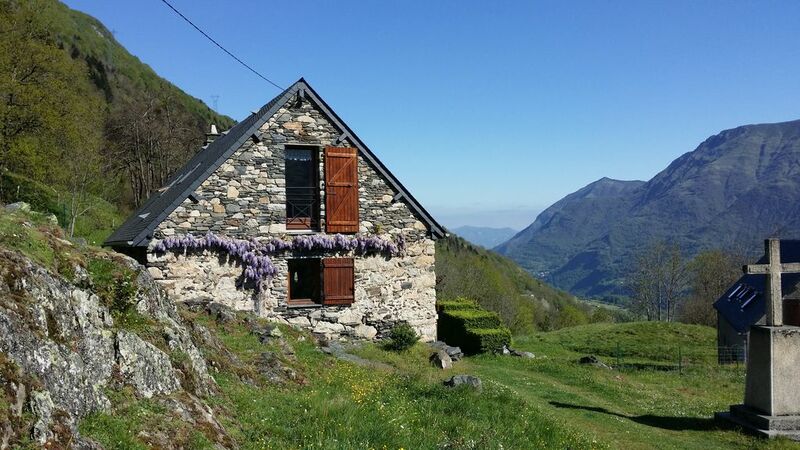 Authentic Pyrenean sheepfold renovated with respect for local heritage and equipped with every comfort. Quiet, at 1050 m above sea level surrounded by a beautiful private park of 1ha. An exceptional view of the mountain facing the peak of the south. Large interior space (130m2). Accessible by car from municipal road cleared in winter. Private parking for 3 cars. Ideally located for skiing, hiking and spa treatments just down the road. The sheepfold is ideal for disconnecting and enjoying the surrounding nature, with friends or family. The interior comfort and the equipment allows good moments of conviviality. Overall we (American family) had a phenomenal time in Luz. And the sheep barn is indeed a special place. Pros: Sophie was a good host to book with (even with the language issues we presented, and accommodating a late arrival). Phenomenal view. Cool to stay in a sheep barn. The kids loved the donkeys in the backyard. The interior has been restored beautifully. There was a cool hiking/biking trail access right at the house. It was very, very quiet and peaceful at night. The kitchen worked great. Just a thrilling place to stay for those reasons. And Luz has so much to offer. On the neutral (things to know): the hike/bike trail is in high use during the day, so despite the remote location, people are regularly wandering/biking right by. It is a solid 10-15 minute winding road up to the location, which is part of the adventure, but it isn't easy to just go grab something from town; your days take a little planning. You have to get your own TP, paper towels, coffee, etc. Would have been nice to have those basics stocked with at least enough to cover the first few days, particularly given the drive back to town, so that we didn't have to go the store first thing. The washer/dryer works, but is small, so laundry can't be done fast (we found the same all over France/Spain). On the "suggestions/caveats" side: there is actually a neighboring house about 30 feet away, partially blocking the view; the pictures of the property crop that out (the neighbor wasn't a bother at all, but it was unexpected based on the marketing of the place). Also, there was some guy who actually came into the gate and yard (I think to feed the donkeys) early each morning and it was just unexpected, with the apparent remoteness and privacy, to have a guy just walk by the windows while we were in our PJ's. Finally, some aspects of our American version of comfortable and clean wasn't met by this place. When we arrived there were quite a few cobwebs (perhaps we were the first of the season? ), and the sheets were thin, one had a stain, there were no top sheets, and we had to pay 15E extra for what turned out to be some pretty skimpy bath towels; there weren't any hand towels at all for the kitchen and downstairs bath. Just a bit disappointing on those fronts, but maybe partially a cultural thing. Overall, actually a unique and highly recommended place provided you are aware of the caveats (and again Luz is simply a magical place to visit). Belle propriété, bien située, et bon accueil de la part de nos hôtes. Merci beaucoup pour un séjour plaisant. Séjour de rêve, reposant, dépaysant dans cette charmante bergerie. Nous avons réservé le chalet pour la semaine du jour de l'an avec nos 2 enfants de 3 et 2 ans. Le chalet est superbe, cosy et décoré avec beaucoup de soin. Après une bonne journée de ski, qu'il est agréable de se poser dans le grand canapé d'angle devant un bon feu de cheminée!! Le chalet surplombe Luz Saint Sauveur (compter 10 minutes en voiture de bonne montée du centre), il est assez isolé mais la vue est superbe et c'est le point de départ de plusieurs randonnées. Pour les skieurs, les stations sont toutes à environ 30 minutes du chalet et il existe des navettes gratuites de Luz. Nous recommandons vivement votre chalet et nous n'hésiterons pas à revenir!! Jolie bergerie tout confort, ambiance cosy. Idéalement située tant pour le ski que pour une multitude de randonnées. Nous avons apprécié le calme et la beauté du paysage. Several hiking trails cross the fold. Do not miss, for example, empreinter the famous GR10 with "the cross of Sia" to admire the view of the gorges of Gèdre; count 3 hours from home, to reach the most beautiful lakes of the Hautes-Pyrénées, one of Bastampe (2000 meters).